"The perfect accessory for any rustic-inspired home." "A classic lace look with a bit of modern flair." "Features a vintage-inspired black-and-white cabana stripe." "A bit of sparkle and verve." "Looks much more high-end than its affordable price tag." "A boho-inspired look that’s still a little traditional." 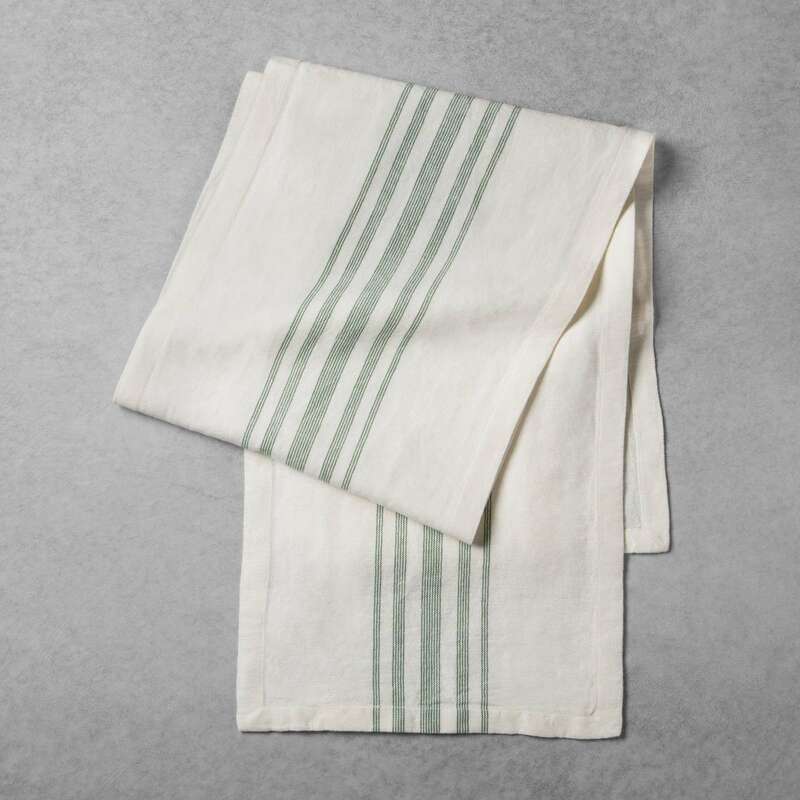 Chip and Joanna Gaines’ new Target line is all about chic, modern farmhouse style, and this Heart & Hand with Magnolia Striped Table Runner is the perfect accessory for any rustic-inspired home. It’s 14” x 72” and made from 55% linen and 45% cotton. It features an off-white base with pastel green stripes running down the middle, giving your kitchen a subtle pop of color that’s HGTV-approved. Target customers adore the Heart & Hand with Magnolia line, and this table runner goes to show why. Reviewers say it’s nice and soft, similar to a tea towel, and cleans easily. It looks great on a reclaimed wood dining table or outside on the patio table. Lace table runners are timeless and feminine and can be easily styled up or down. We love the Harvest Imports Lace Table Runner because it has a classic lace look with a bit of modern flair. It has a floral and leaf pattern reminiscent of a vintage runner and consists of polyester (so you can toss it in the washer without worry). It measures 12" x 74" and is scalloped and tapered on each end, giving it an even more elegant feel. The ivory color is not only a little more contemporary but also makes it easier to keep clean and stain-free. Owners use the Harvest Imports Runner at their weddings and in their home. Most say it holds up well over time, but all lace should be handled with care to maintain its integrity. Check out our other reviews of the best lace table runners​ available on the market today. Black and white go together like salt and pepper; it’s a classic look that never goes out of style. The DII Cotton Table Runner features a vintage-inspired black-and-white cabana stripe. It also comes in cream and white or blue and white, and in 18” x 72” or 18” x 108”. Each stripe is 2.5”, and would look lovely on its own or atop a black or white cloth. It’s made from 100% cotton, and reviewers say it holds up well in the wash. 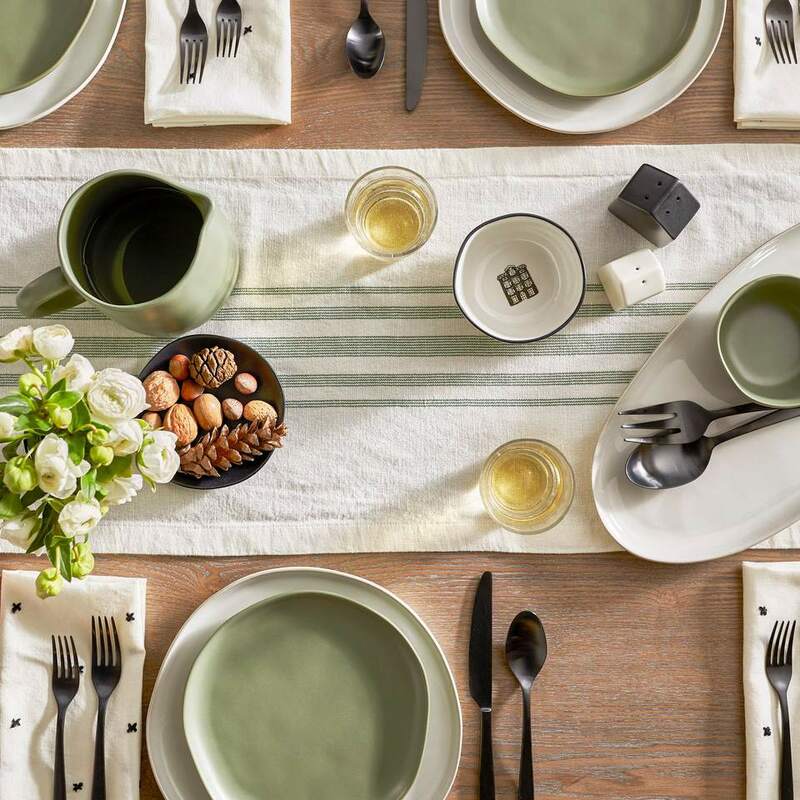 The cotton is soft to the touch but stiff enough to stay put on your table all through dinner. If you want to fully round out the look, the company also sells napkins with the same pattern. If you look forward to pulling out your holiday decor every year, this adorable Sam Hedaya Poinsettia Cluster Table Runner will make your heart skip a beat. The wide-laced red poinsettias are highlighted with Lurex (a metallic material), giving it a bit of sparkle and verve. It measures 14” and comes in four lengths ranging from 36” to 90”. The runner is made from 100% polyester, is machine washable and has delicate but durable embroidered edging. Reviewers say it looks beautiful on a dining table or a coffee table, noting that it’s shiny without being tacky. Linen is a great textile that can be dressed up or down and lasts for years to come. The Solino Home Pure Linen Table Runner comes in brown, gray, natural, navy and purple, and looks much more high-end than its affordable price tag would suggest. It measures 14” wide and comes in four lengths ranging from 72” up to 120”. The 100% European flax linen is a soft, luxurious material that can be washed cold on a delicate cycle. Pair this simple runner with flowers and linen napkins to really complete the look. Burlap is having a moment, and it’s not hard to see why. It’s relatively inexpensive, vintage-inspired and unpretentious. The Designer Burlap Table Runner has a tight jute weave that won’t fray at the ends and looks great on picnic tables, in your dining room or at a wedding. Plus, at less than $20 for 10 yards of 14” thick material, it’s a total steal. It’s manufactured with straight-seamed stitching to allow for a flexible, softer feel than most burlap you’ve encountered. Though you should never put burlap in the washer, this runner will hold up to cleaning spray perfectly well. The Designer Burlap Runner is incredibly versatile — some reviewers also use it for DIY crafts — but it looks great riding solo on your table or bar. Add a few flowers, and you’ll have a rustic chic look that’s perfect all year long. If you’re looking for a boho-inspired look that’s still a little traditional, the August Grove Cavaillon Lace Runner is just the ticket. This 100% cotton runner has a vintage, French-inspired floral pattern with a wide weave, which lets the character of your rustic table can shine through. It’s off-white and 16” wide, with four lengths: 36”, 45”, 54” and 72”. It’s machine-washable, but the company does note that it could shrink a bit due to its handmade nature. With over 150 reviews, the August Grover runner is a fan favorite. Owners use it everywhere in their houses, from tables to buffets to hutches and beyond. It’s beautiful indoors or out​ and makes a great addition to any home’s decor.